D.L. Hughley is one of the most popular and highly recognized standup comedians on the road today has also made quite an impression in the television, film and radio arenas. First and foremost a standup comedian, he stars in his 5th stand-up comedy special “Reset” which is currently airing on Showtime. In addition, D.L’s first humorous book title, I Want You to Shut the F*ck Up, is out in bookstores. DL also created and starred in the satirical documentary special for Comedy Central “D.L. Hughley: The Endangered List”, which premiered to rave reviews this past October. The special was honored with the prestigious George Foster Peabody Award in the 72nd Annual Peabody Awards competition, and it was also honored by the Television Academy Honors earlier this year. Recently, DL tapped into his playful side and participated in the 16th season of the hit ABC show “Dancing with the Stars,” alongside partner Cheryl Burke. In August D.L. 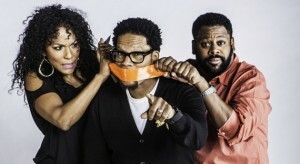 Hughley signed on to host a weekday radio broadcast. THE D.L. HUGHLEY SHOW will be a daily themed, music intensive afternoon drive program from 3-7pm ET.